Cause being chic doesn’t mean just wearing neutrals. With that short glimpse of Spring that we had last week, it got me all excited for Spring / Summer dressing. I was already envisioning cute summer dresses, and went out to shoot this pastel blue co-ord from Loavies. Then this week happened, we woke up to snow (SNOW!) earlier in the week, and I’ve been drenched too many days to count this week whilst walking Frank, though the little diva has been enjoying his blow dry when we get home haha. Spring now seems again like a distant memory, but I remain hopeful that the warm sunny weather will be back soon, well I hope so anyways. 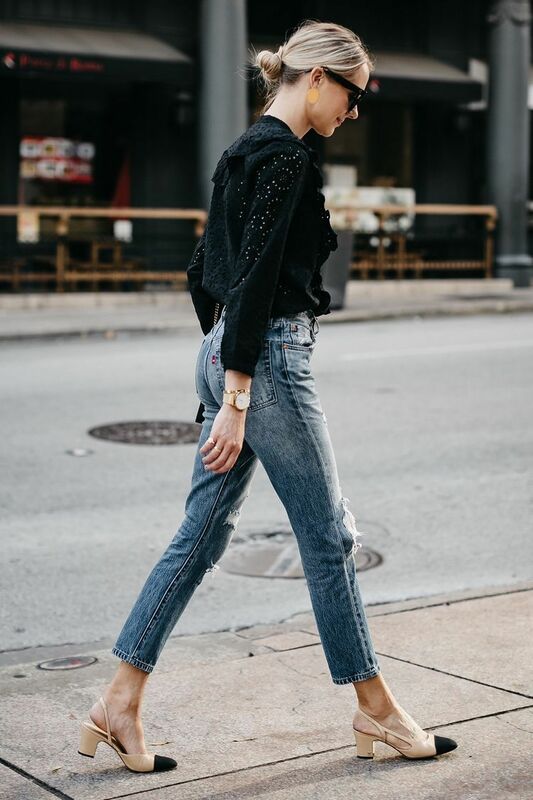 With this in mind, I’m going to continue with my next How To Look Chic (on a budget) series, with a Spring wardrobe addition that I feel everyone needs. And that is ; a pastel co – ord. So I know this totally won’t be for everyone, and I get that. But today, I’m gonna talk about why I’m obsessed with them and actually how wearable they are. 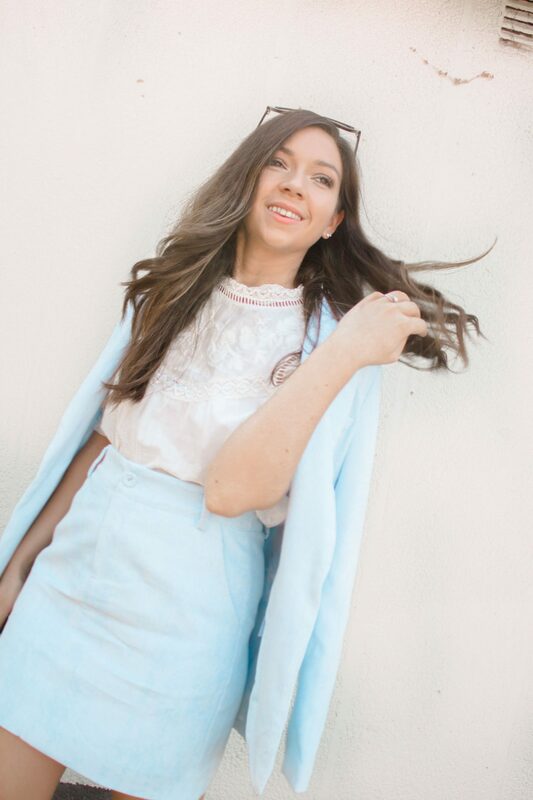 My pastel co ord of choice is from Loavies, it’s a baby blue cord blazer and skirt, and is bit of a million miles away from my usual all black wardrobe haha. But I have to admit, I’m loving having bit of colour back in my wardrobe, and well if you can’t wear pastels in the spring then when can you? 1.You feel super chic and polished in a co-ord : so a blazer and skirt combo is always going to make you feel like you’re a top successful lawyer with your own law firm (mine would be called Legally Brunette FYI.) You’re probably going to feel like Elle Woods when you wear one and that ain’t a bad thing in my eyes. 2. They’re super wearable: I mean you already have two things that match, so it’s just a case of popping a white top on with them and voila a full outfit that looks so put together and polished. 3. It doesn’t have to be a skirt combo: skirt and blazer combo not for you? Well why not op for a trouser co-ord instead? 5. You can dress them up or down : and finally with a co-ord you can dress them up or down. So you can wear them together paired with a blouse etc… for a work outfit that will leave everyone with wardrobe envy, or you can wear them with a t-shirt , or separate with jeans for out of work/more casual. See aren’t the possibilities endless with a co-ord? I can see I’m going to get so much wear out of my baby blue number and I love how polished and chic I feel when I wear it. I definitely feel like I’m ready to take over the world when I wear it and well who doesn’t want an outfit that makes them feel like that? I’d love to know what you feel about co-ords, are they for you? *Disclaimer : these times were gifted to me but I was under no obligation to post about them. For more information on how I work with brands, please read my disclaimer here. Affiliate links have been used in this post, also refer to my disclaimer to find out more about affiliate links and how I use them.